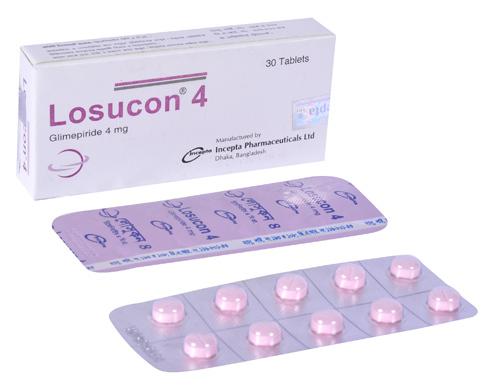 Losucon 1 Tablet: Each tablet contains Glimepiride BP 1 mg.
Losucon 2 Tablet: Each tablet contains Glimepiride BP 2 mg.
Losucon 3 Tablet: Each tablet contains Glimepiride BP 3 mg.
Losucon 4 Tablet: Each tablet contains Glimepiride BP 4 mg.
Glimepiride is a sulfonylurea antidiabetic agent which decreases blood glucose concentration. The primary mechanism of action of Glimepiride appears to be dependent on stimulating the release of insulin from functioning pancreatic beta cells. Glimepiride acts in concert with glucose by improving the sensitivity of beta cells to physiological glucose stimulus, resulting in insulin secretion. In addition, extrapancreatic effects like reduction of basal hepatic glucose production, increased peripheral tissue sensitivity to insulin and glucose uptake may also play role in the activity of Glimepiride. In non-fasting diabetic patients, the hypoglycaemic action of a single dose of Glimepiride persists for 24 hours. 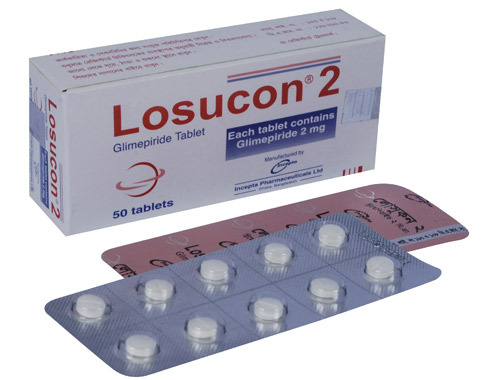 Glimepiride is indicated as an adjunct to diet and exercise to lower the blood glucose in patients with noninsulin-dependent (Type II) diabetes mellitus (NIDDM) whose hyperglycaemia cannot be controlled by diet and exercise alone. 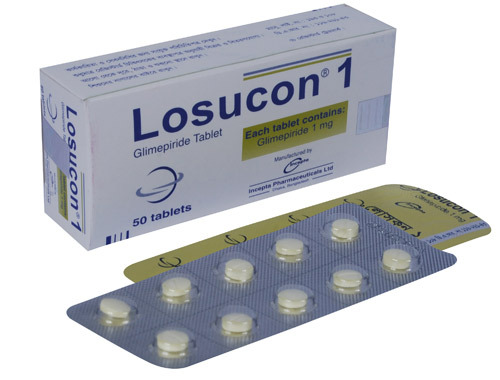 Glimepiride may be used concomitantly with metformin when diet, exercise, and Glimepiride or metformin alone does not result in adequate glycaemic control. Glimepiride is also indicated for use in combination with insulin to lower blood glucose in patients whose hyperglycaemia cannot be controlled by diet and exercise in conjunction with an oral hypoglycaemic agent. Combined use of Glimepiride and insulin may increase the potential for hypoglycaemia. In principle, the dosage of Glimepiride is governed by the desired blood sugar level. 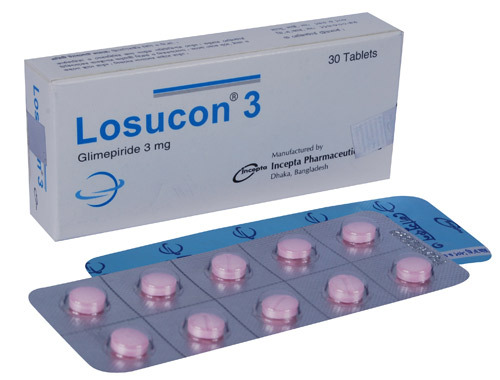 The dosage of Glimepiride must be the lowest which is sufficient to achieve the desired metabolic control. The initial and the maintenance doses are set based on the results of regular check of glucose in blood and urine. Monitoring of glucose levels in blood and urine also serves to detect either primary or secondary failure of therapy. Initial dose and dose titration: the usual initial dose is 1 mg once daily. If necessary, the daily dose can be increased. Any increase can be based on regular blood sugar monitoring, and should be gradual, i.e. at intervals of 1 to 2 weeks, and carried out stepwise, as follows: 1 mg 2 mg 3 mg 4 mg 6 mg. Dose in patients with well controlled diabetes: the usual dose range in patients with well controlled diabetes is 1 to 4 mg daily. Distribution of doses: Timing and distribution of doses are decided by the physician, in consideration of the patient\'s current life-style. Normally, a single daily dose is sufficient. This should be taken immediately before a substantial breakfast or if none is taken immediately before the first main meal. It is very important not to skip meals after taking the drug. Secondary dosage adjustment: As control of diabetes improves, sensitivity to insulin increases; therefore, Glimepiride requirement may fall as treatment proceeds. To avoid hypoglycaemia, timely dose reduction or cessation of Glimepiride therapy must be considered. A dose adjustment must also be considered whenever the patient\'s weight or life-style changes, or other factors arise which cause an increased susceptibility to hypo or hyperglycaemia. Changeover from other oral anti-diabetics to Glimepiride: There is no exact dosage relationship between Glimepiride and other oral blood sugar lowering agents. When substituting Glimepiride for other such agents, the initial daily dose is 1 mg; this applies even in changeover from maximum dose of other oral blood sugar lowering agents. Any dose increase should be in accordance with guideline given above in initial dose and dose titration. Consideration must be given to the potency and duration of action of the previous blood sugar lowering agent. It may be necessary to interrupt treatment to avoid additive effects which would increase the risk of hypoglycaemia. Administration: Glimepiride tablet must be swallowed with sufficient amount of liquid. Hypoglycaemia, temporary visual impairment, nausea, vomiting, diarrhoea, abdominal pain, urticaria, fall in blood pressure. In the initial weeks of treatment, the risk of hypoglycaemia may be increased and necessitates careful monitoring. If such risk present it may be necessary to adjust the dosage of Glimepiride. Hypoglycaemia can almost be promptly controlled by immediate intake of carbohydrates (glucose or sugar). Pregnancy: Glimepiride must not be taken during pregnancy; a changeover to insulin is necessary. Patients planning a pregnancy must inform their physician, and should changeover to insulin. Lactation: Ingestion of Glimepiride with breast milk feeding may harm the child. Therefore, Glimepiride must not be taken by breast-feeding women. Either a changeover or a complete discontinuation of breast-feeding is necessary.